South Gloucestershire Museums Group is an unincorporated association. The aims of the group shall be to promote inspiration, learning and enjoyment through the exploration of museum collections for the benefit of local communities and the general public. Membership shall be open to museums and heritage centres that are open to the public and whose collecting area is wholly or partly within South Gloucestershire. Meetings take place about four times a year at different museums and are organised by the ex-officio secretary, the South Gloucestershire museums and heritage officer. The meetings include museum development to take the opportunity of providing training and development when representatives of local museums, who may be trustees and/or volunteers or professional staff, come together in one place. Where applicable, downloadable presentations from these sessions are available on this page. We are launching a pop-up travelling exhibition to promote local heritage. 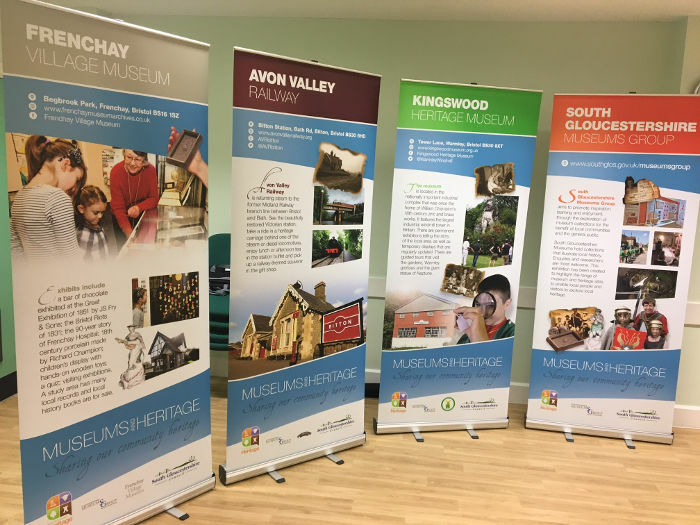 As well as an introduction panel, there is a banner for Avon Valley Railway, Frenchay Village Museum, Kingswood Heritage Museum, Thornbury and District Museum, Yate and District Heritage Centre, Acton Court, Winterbourne Medieval Barn, and Aerospace Bristol. The South Western Federation of Museums and Art Galleries (the SW Fed) is a voluntary subscription based organisation, representing the museum sector along with Art Galleries in the South West of England. This case study on disposal has a take home message – if you do it ‘by the book’ it may not be quick or easy, but can be satisfactorily and rewardingly achieved with support and perseverance.